Today i gonna working on some cool metal materials. I know that metal materials arent finished yet. But maybe they dont need to be to get my expected result. Lets have a look at the following image. As you can see i am trying to catch the material settings like in the right image. This is a screenshot of the unigine benchmark. The left one is what i got so far. I worked with the information of the wiki entry of outerra materials ([size=78%]http://xtrac.outerraworld.com/trac.fcgi/wiki/material[/size]) and so i know that toying around with the Ax should give me control about the metalish look of the material. I took the textures as i understand them. Please correct the setup if you know more than me. I dont really know how a reflection map has to look like. As i understand the reflection is just the color of that texture scaled by Ax. So actually i should get the goldish reflection. But my reflection ingame is silverish what makes sense because my Ax is ~ 0.81. So angrypig, brano told me that you are the god of materials. Please enlighten me. These screenshots need to be BIGGER! They look damn good as is but if you want them better. I am all for it. Great looking materials! Nice work! Nice feel for materials ! Ok, i took the big images. On this scale you see that the materialsettings doesnt work like i want. One thing that maybe people miss there: the values of Ax, Ay and m are multiplied by 0..1 values from the corresponding textures. If you have m = 127 (which is equivalent to m ≈ 0.5), then you are basically limiting the values of m to range 0 .. 0.5. Usually, when you have a texture for given parameter, you set the multiplier in material to 255 (or 1.0). 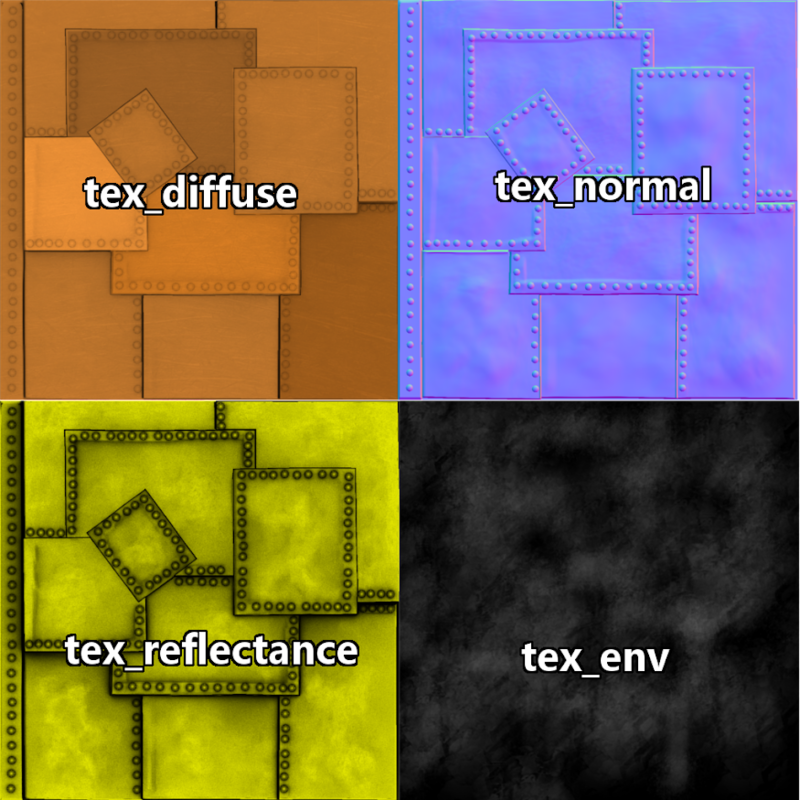 You are using "reflection" texture for roughness and reflectance (tex_env is for roughness) but those are completely different things. Ax/reflectance texture tells what kind of material is there like plastic/metal/diamond, use 7 for common materials and 200 for metallic, this texture should be homogeneous, ~200 for copper and ~7 for rivets (you can add small variations +- 1-2, but it's not necessary). m/roughness texture 0 for mirror and 255 for perfectly matte material. Thank you angrypig. I will post my results here. This were the facts i was looking for. Good morning. It was possible to improve the material with angrypigs hints. Thank you for that. I had to rework the rivets. They are smaller and dont have deformations at the borders. Just the color of the reflection is not as i expected. I made it yellowish, but it just reflects the sun. So its white over the day and goldish at dusk and dawn. I read somewhere, that the color of the reflectionmap controls the color of the reflection, if someone doesnt want the normal sun reflection color. So i guess, i could make my reflection map even grey and the result would be similar.